Cue her first squeaky toy. It made its first squeak, and Elka leapt away from it, and stared at it from a remove, "muppet mouthing", with a concerned wrinkle on the top of her head. Was she hurting it? But it was a toy! But she didn't want to hurt it. Cognitive dissonance in action. She's gotten a little..."braver"? More cavalier? And will now play with a squeak toy, occasionally squeaking it, but for the most part gentle enough on the toy itself that it doesn't squeak., but while jumping around and talking to it. So I got a squeak toy dinosaur at the Dollar Tree. Elka was pretty interested in the dinosaur, and took it without much prompting. This was part of the "lay down, nose it, and talk to it" portion. Winding down. 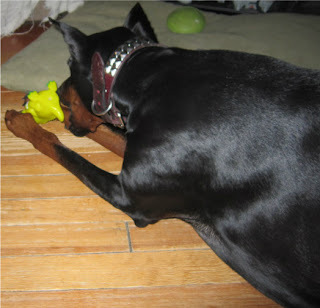 It's amazingly hard to get pictures of a Doberman jumping around with a toy (that I'm willing to show you). You can also see a bit of the already fraying blanket that Elka may or may not have helped along a bit, but none of us have caught her at it. LOL, that toy wouldn't last 33 seconds in Koly's mouth. We trained him in the same manner (Did the neighbors look at you like you were nuts? )I think it's adorable that she chats with them instead of slaughtering them like Koly. Our neighbors are either college students (99%) or not social (that one house next door), so that was never the social issue. Talking to her as though she's a person while I'm on walks.....that's another story. I do love that Elka talks to her toys. I love how much she does talk! Unfortunately, she also quietly chewed mostly through the toes on one foot (I thought things were going too well!) and now it only squeaks with vigorous abuse. It'll still be a good "sometimes toy"; there's only so much peanut butter you want to put in there, while still keeping 'em occupied, so when the Kong or Monster Mouth is done, it's squeak toy time. I understand how hard it is to get the picture you really want! My dober girl is just the silliest thing, a real goofball. At 7 yo, she still acts like a puppy! She walks around the house most of the time with a stuffie toy in her mouth. 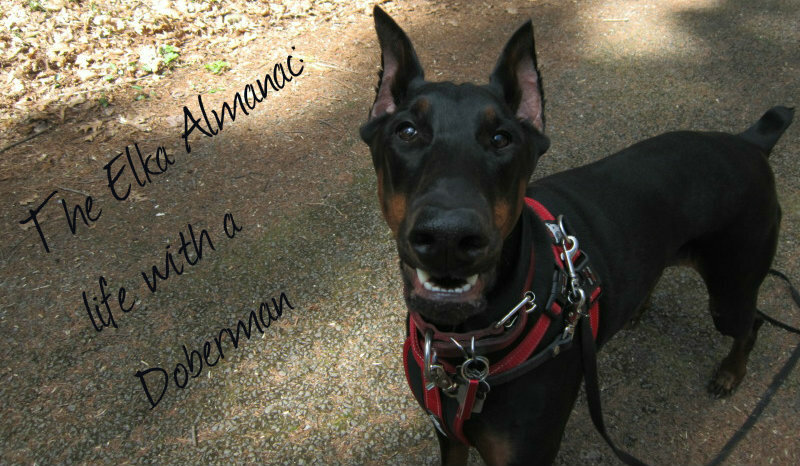 But pick up a camera to get a picture of her at her silliest, and the toy is immediately dropped, and she strikes a serious Doberman pose! She's just so fast, and the digital camera shutter speed so slow! In addition to her going "Oh, the camera...." and striking a different pose! The louder the squeak, the longer they last. Alas, the dinosaur (after tonight's session) squeaks no more. Ah well. It was only a dollar. Oh Elka! My favorite toy is a plastic squeaky toy. I love it! Kyuss has always destroyed every toy I've ever gotten him. From plushies and ropes to bones and kongs. He is a master of destruction. He got a ball for his birthday last july. It's amazingly tough and it squeaks! It's lasted this long surprisingly. That little dino however, wouldn't stand a chance. Awww, I LOVE squeaky toys!! It's too bad that I pop a lot of the squeakers, though. Heh. I am impressed you captured the photos you did! One can only imagine the silliness of an Elka at play. I think it's so sweet she is so gentle with her toys, even when she doesn't have to be. First, may I invite y'all to visit 1/31, anytime after midnight tonight to pick up your "one lovely blog award". Second, Elka reminds my Human of her Chessie before me, a female, who once a toy squeaked wouldn't touch it. My Human got all her toys from the childrens' toy department. Soft toys designed for infants. Me? I love squeaky things! Jennifer Donohue. Awesome Inc. theme. Powered by Blogger.